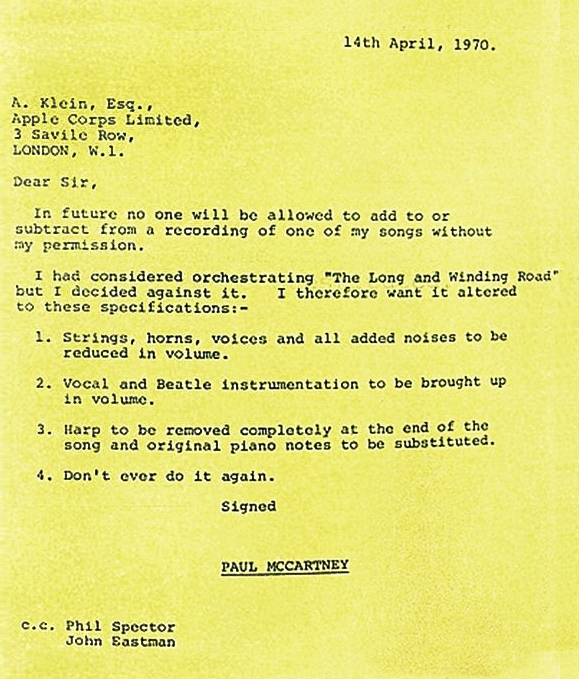 Dave sends this great letter from Paul McCartney to Alan Klein. From the Hunger Games: Catching Fire soundtrack. Things I don’t like about this version: The way Ella Maria Lani Yelich-O’Connor sings the word Rule. Things I do like: Everything else. Vanishing Point: It’s got night, neon and narcotics, and that wonderful ingredient of Seventies movies: it looks like it’s shot by a photojournalist. Beautiful stills of road vistas, strip towns, old lined faces, the angles of gas stations and wells. It sounds fantastic, the throb of a muscle car engine on heat haze roads, or cutting arcs in the Nevada Desert to tremolo’d guitar. Banjos frail and sirens wail. It’s got Cleavon Little, two years before Blazing Saddles, playing a blind DJ in full flight (The Big Bopper was the model, and Littles’s performance undoubtedly an influence on Robin Williams in Good Morning Vietnam). It’s got Delaney & Bonnie as a Christian rock band at a desert festival. It’s got implacable Barry Newman, here reminiscent of James Gandolfini. It’s got a race with a customised E-Type Jag, soundtracked by squalling guitars and hi-hats… For two-thirds it’s a great film (the flashbacks and hallucinations, not so much). If you liked Two Lane Blacktop and Serpico, check it out. In the smallest cinema known to man – around twenty seats – and at a bizarre angle to the way-too-close screen, we see two trailers using music to different effect. The Monuments Men, a film set in the Second World War, features crashing r’n’b/hip hop to try to convince a younger audience that George Clooney and Matt Damon are worth taking a punt on even if, hey, it’s all old-fashioned looking and about saving paintings. The Dallas Buyers Club, on the other hand, goes for the stamp of authenticity (if not accuracy – it’s set in 1985), using the raw emotion of the Alabama Shakes “You Ain’t Alone” to spill between cuts of Matthew McConaughey giving what looks like his best performance yet. And, dammit, it works. Woody Allen’s music editor must wince every time they start a new film. “Shall I go and get the King Oliver, Mr Allen?” This anachronistic schtick, classic jazz in the present day, got old about twenty years ago – now it’s just bizarre, a stylistic tic that means nothing. Yes, I get that Jasmine is a character out of time, Blanche Dubois in a Bernie Madoff world, played by Cate B, acting with a capital A. But bleating on about “Blue Moon” – playing when she met her beau – to a succession of uninterested people is just weird. Added to which, I can’t get the image of Woody Allen sitting in his room writing a character who leaves his wife for a teenage au pair out of my head.